Crazy art, surrealism or metarealism? It’s all crazy art, isn’t it? What is “crazy art” aside from a naïve label, probably bestowed by a sincere art outsider? It is forgivable when “crazy art” is used as the layman’s password into the realm of exploration¬—like initiating a web search. Hopefully this kind of low target search may lead them to a deeper understanding and a more refined vocabulary. Art is constantly indexed, and categorized with labels like “crazy art” and isms that satisfy our need to group things into referential bins. We stack them, ready for retrieval from our reference warehouse, ordered in a way that best suits knee-jerk access at the opportune moment. Often times the broad categorization bundles loosely-associated things into a catch-all taxonomy, so labels like “surrealism” come to encompass anything that’s a little off kilter. In this case, there is no service done to the 20th century art movement that Andre Breton cemented into art history with the likes of Dali, Magritte and Ernst. The intellectual foundations of the movement are marginalized by the convenience of describing something out-of-the-ordinary as “surreal”. Just as it is important to differentiate that hail and a hurricane are not merely weather, but very distinct types of weather, it is important to identify that different art fits its definition with some accuracy. I understand that the impulse to cast my crazy art as a surrealism is more accurate than to label me an expressionist but in some ways it’s like defining a species by its phylum. Other labels like “lowbrow” and “pop surrealism” have gained traction to some degree but miss the mark as well. Lowbrow usually pertains to a naïve, self-taught kind of art making that tends to side on the primitive spectrum of things. Pop surrealism, for the life of me, has taken on an affinity for portraits of child-like waifs with big, Margaret Keane-style eyes. Cute, but I don’t want to be part of that. My problem with the surrealism label is largely due to my disassociation with Freudian psychology. Whereas the authentic surrealists held/hold Freud in high esteem and revelled in the unencumbered subconscious to inform their art, I allow a very conscious and deliberate mind to direct my work. The so called metarealists seem to adhere more to this deliberate kind of thinking but their own definition is as elusive and abstract as post modernism was to us in the 80s. Someone once described my work as “bubblegum” surrealism, which I’m sure was meant as a slight insult but was ironically appropriate. Like the Bubblegum pop music of the 60s and early 70s, which took popular forms of music with an edge, like psychedelic and garage, and distilled them into palatable, marketable and more benign forms, I too soften my edges. In some ways I have made my art more benign by introducing nursery rhyme characters and children’s-book characters into it, along with my saturated candy-colour palate. Using the characters as conventional symbols pulled from our common, western heritage, they come pre-loaded with meaning and act as comforting interlocutors for the viewer, drawing them deeper into the unusual settings. Maybe the labeling should be left to the experts, the critics, the commentators and journalists. If my crazy art has any merit or integrity to warrant that kind of distinction—where someone deems it worthy of branding with an identifying label—then maybe that’s the true test of the art’s power on others. Then again, nothing but thick, jaded skin will defend us from things like “engineered demand” and hollow marketing messages. The hype-machines will continue to spew out brands and labels, fighting for the last ounce of our scattered attention. If someone discovers my art based on a “crazy art” query, so be it. I can be the “crazy artist”. 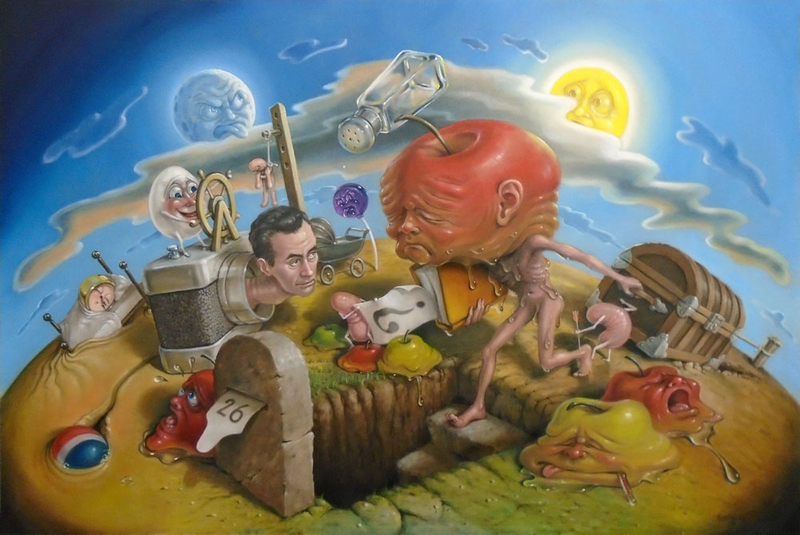 This entry was posted in Canadian art, Canadian Artist, Canadian painter, Canadian Surrealism, crazy art, metarealism, Pop Surrealism, stephen gibb artist, Surrealism and tagged canadian art, canadian artist, canadian pop surrealism, canadian surrealism, painter, pop surrealism, stephen gibb, surrealism. Bookmark the permalink. Both comments and trackbacks are currently closed.